He is right, and he is wrong. He is right about the danger which exists in a vacuum. Unfortunately, he’s wrong about the fix being “simple.” We’re in for a roller coaster of societal disruption. I share his post with you as a real-life lesson learned, as a caution we Alaka‘i Managers should remember in our own culture building in the workplace. A vacuum created by not fulfilling the needs of our ‘Ohana in Business, is just as crippling as a vacuum in society as a whole. On the other hand, corrections often happen at a grassroots level, where factors are completely within your control— just apply your Aloha Intentions. Any vacuum in a workplace is a huge red flag. There is no Aloha Spirit-sucking vacuum in a healthy workplace. Assuring workplace health is Job One of the Alaka‘i Manager — review the chapter on Mālama in Managing with Aloha, and revisit any notes you made there about your Kuleana, responsibility, with your workplace’s stewardship. Consider your workplace to be a microcosm of society as a whole, for that is what it will always be, no matter how incestuous and un-Kākou a company may be in recruitment, hiring, selection, and the forging of all partnerships. People come connected. Connection to community, and today to a very global community, is the basic assumption we must always keep in mind as managers. Life is not a solo proposition, and people operate in circles of influence that are much larger than the protective shell or soothing nest of any workplace. however it will never be an island. That assumption is very much at play in every single one of our 9 Key Concepts in some shape or form, and particularly with Key 6, the ‘Ohana in Business as a culture you build, foster, nurture, and steward. As proactive culture builders, we cannot ever forget that people come connected, and second, that silence usually begs to be filled. Our vacuum-filler? Dedication to our values, mission, vision. We are constant, and consistent about working on our value alignment. Culture is learned. Culture represents a series of agreements based on value alignment, and results from honoring those agreements. The great manager, and the great PERSON, manages their own behavior by tapping into their values as their source of human energy. It’s the way they “lead by example” conducting themselves with ALOHA distinction, and it’s the way they inspire the culture they operate within. Be Alaka‘i. Build an Aloha Culture with your Aloha Intentions. Yes… I repeat these concepts for you, because they have been proven to work for us. What do people need from you? They need to feel they have your attention, and they need to feel you will not forget about them, or ever neglect them. 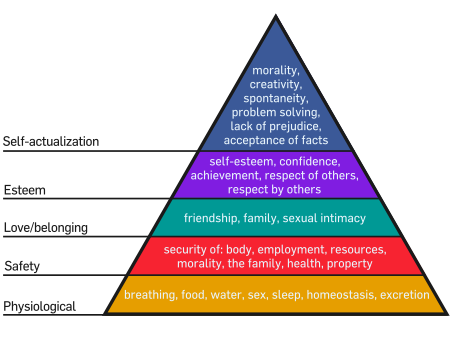 It may also help you to revisit Maslow’s Hierarchy of Needs. I have always felt his advice was sound, and readily applies to how a manager can work their way up the pyramid, from the basic fulfillment of foundational needs, to the higher levels of growth and development. From Archive Aloha on TalkingStory.org: Sense of Workplace: It’s Milk, Maslow and You. Time for a refresh here on this blog too?